Graduation is a milestone event that should be celebrated by all. Let Memorable Gifts help you give the lucky graduate a remembrance that will acknowledge this important day. With personalization, each gift will be even more special to the new grad. A photograph of the happy graduate in cap and gown will showcase this proud moment in time. This attractive wood and metal frame will hold a 4” x 6” photo – but best of all it can be personalized with the grad’s name, the school and date of graduation – making it a memory that will last forever. Graduation key chains are an excellent reminder of the new grad’s achievement and one that they will use every day thereafter. One side of the shiny silver star charm can be personalized with the grad’s name and the reverse side can have the acronym of the school and year of graduation. A new graduate loves to flaunt his or her successful achievement and what better way to do that than with a white ceramic coffee mug they can use every day. 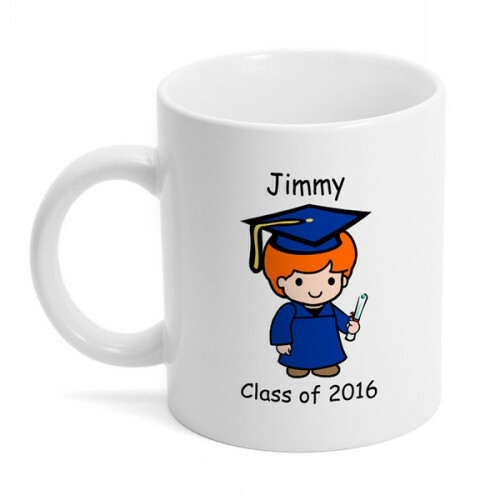 Each mug can be easily personalized with the graduate’s name and year of graduation – along with their gender, hair color, and skin tone – making it a uniquely clever gift they will enjoy. 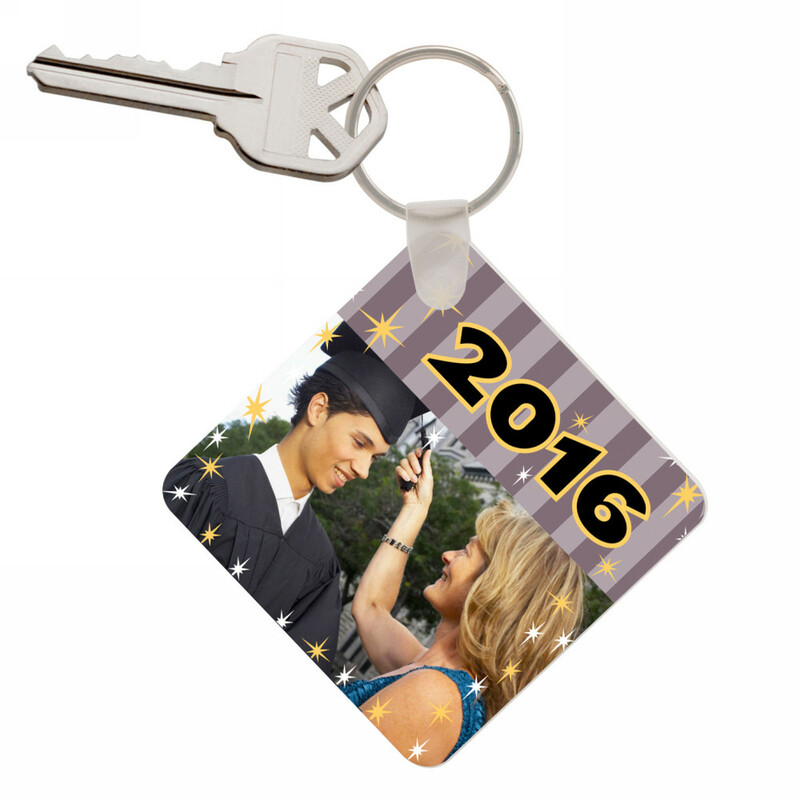 Give your new grad a gift that will showcase their significant achievement. With this special memento, you can have a photograph printed on the 8” x 10” wood panel that is decoratively adorned with a diploma and can personalize with the grad’s name and year of graduation. A stylish silver matte finish diploma with decorative graduation accents that rests in a matching stand that can be personalized with your favorite grad’s name and date of graduation . This is a gift that will be prized by all! 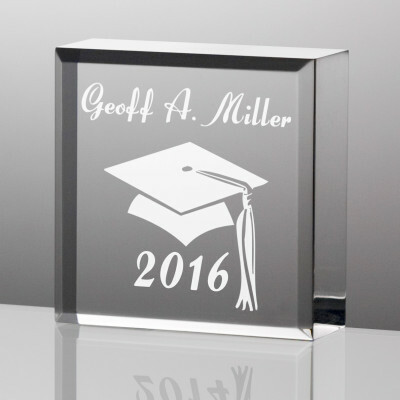 A handsome acrylic block keepsake memento of a graduate’s memorable day will be a wonderful gift for the new grad. Decorated with the traditional tasseled cap you can have it personalized with the graduate’s name and year of graduation so it can be a wonderful display on a desk. A graduation class photograph will make a great remembrance for all, especially when it’s displayed on a key chain where it will be used every day! With a graduation hat accent and the year of graduation accenting the photo of the classmates, they will all appreciate the memories of their time together. An attractive alder wood frame makes a great display for a 4” x 6” photograph of the proud graduate! This frame comes with “Congratulations!” written across the top and a gold cap accent. It can be personalized with the grad’s name and year of graduation to make a gift that will be a sure hit! 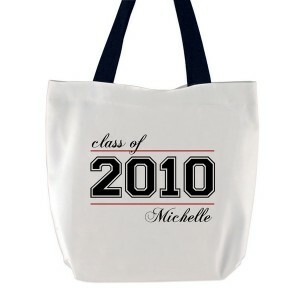 Any new graduate will be thrilled with a white canvas tote bag that proudly displays the year of their graduation along with their name. Handy for books or a day of shopping, this tote can go anywhere and will be used often. Everyone will know that this tribute is to a Star Graduate! What a great idea for a new grad to recognize their achievement! 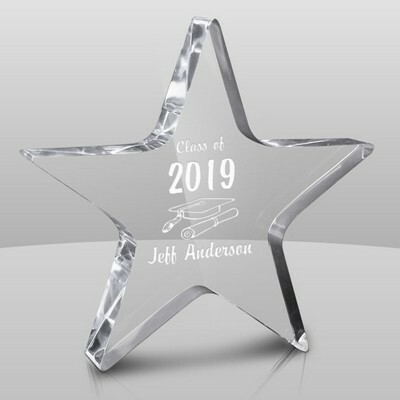 Made of acrylic, with a graduation cap and diploma accents, you can personalize this gift with the grad’s name and year of graduation. Graduation is a time to celebrate, and what better way to do that than with a personalized gift that will hold lots of meaning for the new graduate. 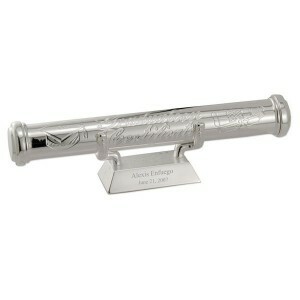 Choose from our selection of personalized graduation gifts that will hold a lasting memory of their achievement.